Wind: Wild. Fierce. Edifice-rattling. Extreme. Gale-force. Bone-chilling. Relentless. 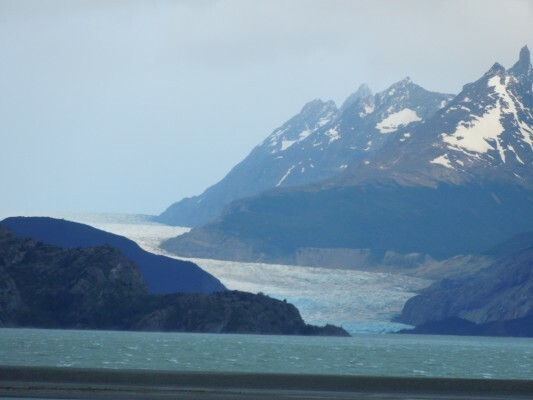 These are the adjectives that come to mind in describing the wind conditions in Chilean Patagonia. Imagine hiking and being buffeted back and forth, nearly knocked off your feet, slapped in the face by the howling gales. What an experience! Ah, but the mountains and the lakes, the dramatic cloud formations, the glaciers, all are simply spectacular. 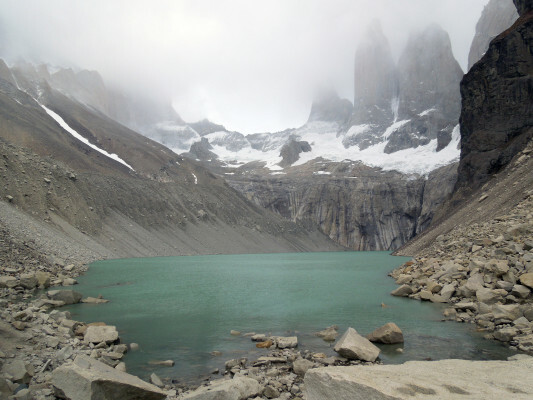 I’ve just hiked the “W” in Torres Del Paine National Park, a four day Refugio-to-Refugio adventure featuring 30 hours of challenging hikes and some of the most beautiful scenery I’ve ever seen. 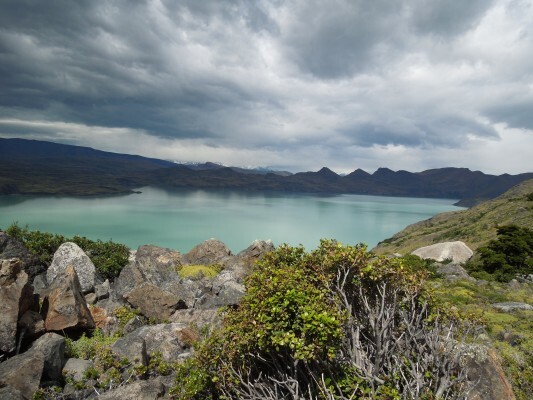 Our first day involved a 9 hour hike over rugged terrain to the famous Torres del Paine, the three signature towers sitting above a teal-green glacial lake. Although it is summer here, the day featured all four seasons including the above-mentioned wind at what seemed like hurricane intensity, rain, snow, and sun. The second day was a more leisurely 6 hour hike along the shore of Lago Nordenskjold, on a crystal clear, almost windless day. 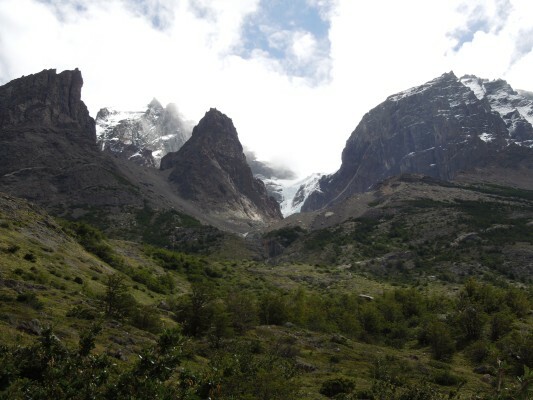 Our third day was a 14 mile, 10 hour, affair into the French Valley with amazing views of Paine Grande, at more than 3,000 meters, the highest peak in the Paine Range. Snow-covered with hanging glaciers and rhime ice at the cloud-covered summit, it was mesmerizing to eat lunch and gaze at the mountain while sitting in a spot temporarily sheltered from the onslaught of the almost ever-present wind. And the fourth day began with a 5 hour hike to Lago Grey. The wind was so fierce that our guide instructed us to duck down when instructed so as not to be swept off our feet or, if the situation became too extreme, the group members would have to hike holding hands. Fortunately, neither of those measures became necessary. When we arrived at the lake, we boarded a boat that took us up close to the Grey Glacier whose three tongues come right to the water. 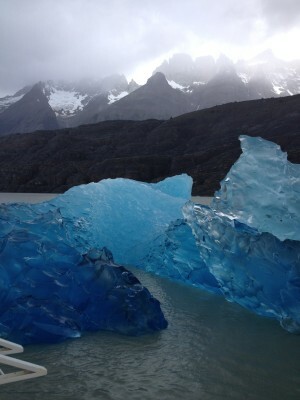 The captain took us way up close to the glacier and let us touch an iceberg, the bluest of blues in color and magnificently carved by nature. It was touch and go right up to the last minute whether this boat trip could occur due to, you probably guessed, the severity of the wind. 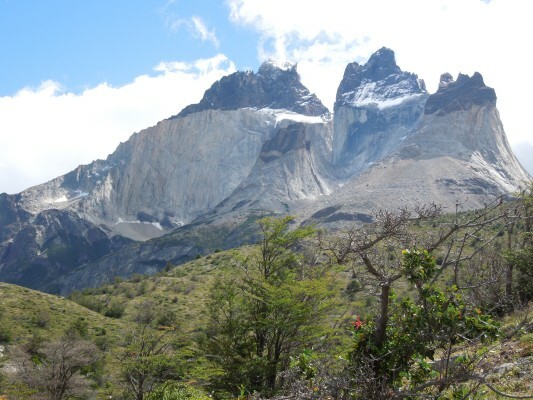 And now I am looking forward to giving my hiking boots and feet a badly needed day off before we continue the adventure in Argentinian Patagonia!